According to the National Sleep Foundation, as many as 61% of postmenopausal women report insomnia symptoms. 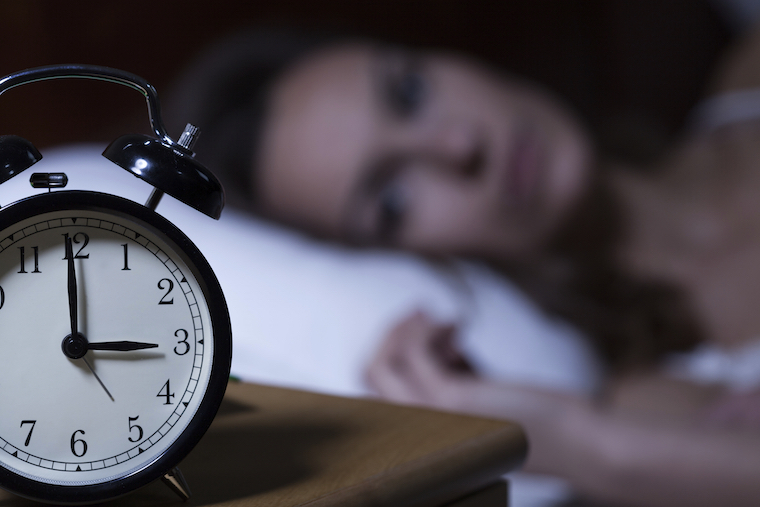 The menopause is a time of major hormonal change and can often be a trigger for insomnia. Lack of progesterone is a big factor, since progesterone is known as a sleep-promoting hormone, while the reduction in oestrogen leaves one more susceptible to environmental factors that can disrupt sleep such as light. In addition, hot flushes with their concomitant surge of adrenaline can also disrupt sleep. Let us not underestimate the devastating impacts of lack of sleep. A study published in Harvard University’s Harvard Women’s Health Watch found that women who sleep less than 6 hours per night suffer from memory loss, weight gain, irritability and poor cardiovascular health. A 2004 study at the University of Chicago Medical Centre found that young adults made to sleep for 4 hours instead of 8 hours had reduced ability to make and respond to insulin, produced less thyroid hormone, produced more cortisol and struggled to remember things and concentrate). Lack of sleep causes weight gain (it increases ghrelin which is the hunger hormone), reduces leptin (the fullness hormone), lowers thyroid activity and increases cortisol. 1) Try to wake up at the same time every morning rather than sleeping in - this is so that your body falls into a sleep-wake cycle based on you getting up at this time. With age we produce less melatonin which is a vital hormone and antioxidant. Studies show that melatonin not only helps some people fall asleep, but also enhances the quality of sleep. Melatonin comes in immediate release and extended release formulations. The immediate release formulation may be useful if you have trouble falling asleep, and the extended release formulation may be beneficial if you wake up in the middle of the night. A combination of the two can also be used. Studies have shown that taking melatonin for sleep not only helps you to fall asleep, but also puts you into a deeper level of sleep which is crucial to feeling rested during the day and in this way melatonin could help re-establish a sleep cycle. 2) Hormone replacement may help, since loss of hormones is a cause of insomnia. 3) Avoid spicy or acidic foods that may worsen hot flushes and avoid alcohol before bedtime as although alcohol may give the illusion of helping you to fall asleep, it induces a poorer quality of sleep. Alcohol drunk up to 6 hours before bedtime can have an impact. Avoid caffeine in hot drinks or sodas after 12pm. However, make sure that you eat enough - low nighttime blood sugar levels are an important cause of early wakening. A drop in blood sugars will cause a surge in adrenalin and cortisol and wake you up. Foods that help induce sleep are oats and milk, bananas, walnuts and cherries. Complex carbohydrates eaten with tryptophan containing foods such as chicken, turkey, milk and eggs will boost serotonin levels and serotonin converts to melatonin and aids sleep. So try eating these before bedtime, particularly if you wake in the night feeling hungry. 4) Dress in lightweight clothes and consider using a fan or air conditioning to help hot flushes. 5) Practise mindfulness: listening to a mindfulness app such as Headspace can help you fall back to sleep again. 5HTP 50-100mg taken near bedtime with a carbohydrate source such as fruit juice is converted in the brain to serotonin. In double blind clinical trials 5HTP helped decrease the time required to get to sleep and decreased the number of awakenings. L-theanine 200mg has been found to induce a sense of calm and improve sleep quality. At higher doses of 400mg it has been shown to exert a sedative effect. Valerian - 150-300mg taken 45 minutes before sleep may improve sleep quality, supported by double blind clinical studies. I am in favour of natural remedies to support sleep as the two primary classes of medications for sleep, benzodiazepines and antihistamines, disrupt sleep patterns in the longterm and hence can create a vicious cycle of dependence.